6:00 Wakeup in the middle of the bay, inhale the fresh air, watch the sunrise on broad horizon and admire the breathtaking seascape. 9:45 Farewell brunch is served at the restaurant. You could observe the scenes at different angles and grab this chance to do a photo hunting as the boat slowly cruises passing by many islets of Halong Bay on her waterway back to pier. I moved to Hanoi very recently, and my old bestie visited me. 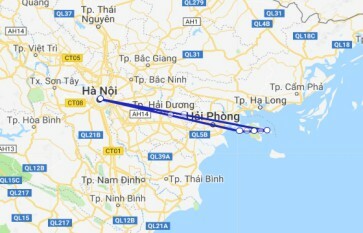 I have traveled a lot, lovSo I wanted to make the best plan for her. We got to know about this cruise by chance, and got to hear it’s 5stars, and new. Which means, our expectation was already quite high. But my/our experience was way-beyond our expectation. The food-fantastic, the facilities-same as a great hotel in town, programme-so authentic and adventurous, staff-can’t be nicer than that. Especially Tony was amazing. Even if it was only one-night trip, I already feel like he is my close friend. If I join in this tour again, the reason is gonna be Tony. Thank you so much, you cruise crew. Big kisses. Great experience with these 2 days/1night cruise with Lapinta team. Very spacious room, clean, confortable. The staff is really profesionnal and friendly. Special thanks to Tony, Ha, Ning and Cherry! Good activities. The food was good. Above my expectations. I highly recommend it. Very comfortable cruise with great staff for a very reasonable price. The food was excellent as was the weather, and staff member Sam was a great host for our table. 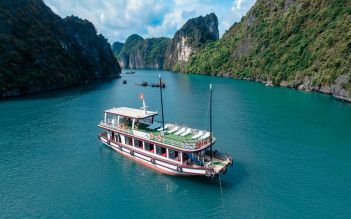 Would recommend this boat for anyone who would want to take a cruise in Halong Bay. Greetings to the whole staff from the 4 swiss guys. We have just returned from one night cruise aboard La Pinta. Had a fabulous time. The cabins were large and luxurious. The food was excellent. The crew were delightful - very friendly and good to chat to. We enjoyed the caves with Ling who was very knowledgable, kayaking swimming and sunrise photography. Wish we had another night. We were fortunate too to have be part of a truly international group. Special thanks to Hà Ling Tony and Sam and all the staff. Thank you!!! We thoroughly enjoyed our LaPinta Cruise in Halong Bay this week! Customer service is excellent, the cabins are very beautifully done, and they catered to all our needs. They organized great tours/activities, were very welcoming, and the cruise was so well organized. I would highly recommend this cruise line to anyone! We had the best time, in large part due to the cruise crew. Thank you to Tony, Ha, Ning and Sim. You made our cruise perfect! Thank you so much!